On a recent trip through Vermont, I stopped at the King Arthur's Baker's store in Norwich, VT. This was the second time I have visited this store. Being someone who loves to bake, I found this store incredibly overwhelming in the most wonderful way. They had every sort of gadget you could think of and baking supplies galore. There was also an extensive array of flours, yeasts, and add in munchies. Not only is this a wonderful baker's store for supplies, there is also a cute little bakery where you can find all sorts of artisan bread, pastries and lunch goodies. I bought a plain old baguette but it was delicious. If you are closer to the store, there is a variety of classes year round to try out. To learn more visit, The Baker's store. In the most recent Food and Wine magazine (April 2010), they really went all out on wine. Yes this makes sense considering the name is Food and Wine, however, normally it is more 50/50 food and wine. I tend to be more interested in the food portion even though I do quite enjoy wine. Thus, the April issue lended itself to be more of a flip through kind of magazine for me instead of an actual reading material. In the flipping through process my eyes glanced at an article titled "An astrologer's cosmic guide to food and wine". Now I am a Virgo through and through so I was very interested in seeing how my sign translated to my food and wine styles. Virgos demand quality and dislike excess in their food. True for the quality, but I have been know to be excessive in my desert choices. The favor fresh-flavored dishes like green salads. 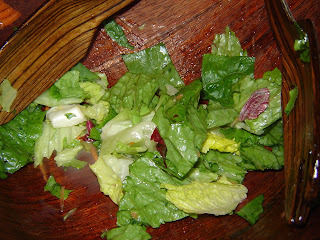 I wouldn't go so far as to say my favorite food is a green salad but I do like them. For wines, whites with impeccable clarity, like Rieslings are best. This I can outright deny. I don't like white wine. It takes a lot for me to have even one glass regardless of the kind. Jordan is a Libra and they are said to like comfort foods. This seems to fit. Taurus tend toward rich or sweet foods like almond croissants. Can't everyone fall into this category? Clearly I take all of this with a grain of salt but it was fun to look at. Now I just have to figure out what Tannic wine is? (Capricorn's top pick). Wanted to let you all in on a little secret called restaurant week. Right now in the Hudson Vally restaurant week is in full swing till March 28th. I highly encourage those to pick a new restaurant to try out during this time. For those of you not in the know, restaurant week is a new thing that happens across the country where restaurants get together to offer 3 course fixe prix meals for around $30, some places also offer lunch for around $20. It is a great way to try out new restaurants and experience fancier places you might normally be able to afford for a cheaper price. The offerings are extensive. So be on the look out if you are not in the Hudson Valley, I promise restaurant week will find you soon enough. Otherwise go to Hudson Valley restaurant week and check out what is available. 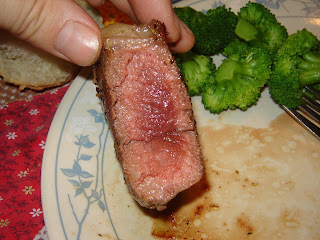 Here Jordan is showing off his cooking skills with the perfectly saute of medium rare lamb. Jordan and I were gone all last week for work. We got home to an empty pantry and empty refrigerator. We got by the first two nights with takeout and leftovers but come Saturday I was ready to hit the grocery store and have a great meal at home. 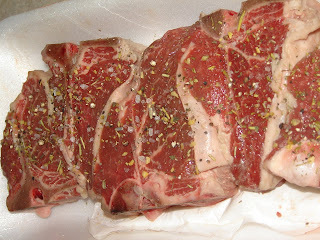 Looking for something different to have my eyes wondered over to the lamb portion of the meat counter. I like lamb but it is one of those meals I always order at restaurants. I never thought to make it at home. Well, this must have been my lucky day because there happened to be a lovely package of lamb chops sitting there and they were on sale. So I took the leap and bought them. Jordan always enjoys a food adventure. And he is always willing to hunt down a recipe for a new meat dish. The recipe really did not consist of much. 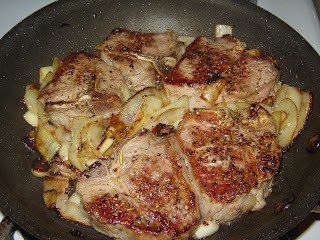 Simply season the chops with salt, pepper and herbs de Provence on both sides. 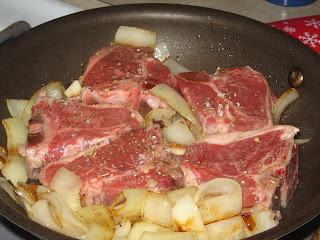 Saute chopped onions and diced garlic in olive oil and then add chops. Cook about 4-5 minutes each side. Volia! A wonderfully traditional meat, veggie, and starch meal. 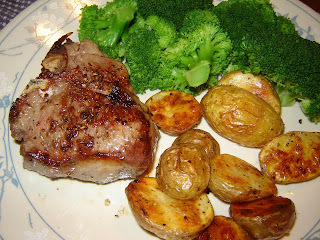 Lamb chops - who knew they could be so easy and so delicious. 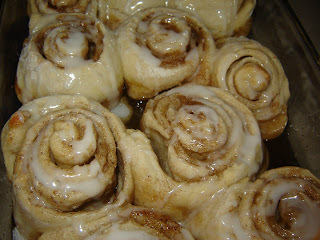 One of the things I love is a hot cinnamon rolls. No ordinary grocery store boxed bun will do. It must be big, gooey and warm to make me dive in. This is surprisingly a hard find. Thus I absolutely indulge when the opportunity presents itself. The bakery I worked at in high school made cinnamon rolls on Fridays and Saturdays like clock work. I know how to make them. I just never felt up to the effort first thing in the morning. Plus knowing myself, I knew that one batch would probably be finished off come 10am, not something I want to advertise. I simply just never put myself in that position. However, after yet another week of travel for work, I need a gift for me. No I was not going to wake up at 5am to start the yeast dough, but I figured pizza dough would certainly work. 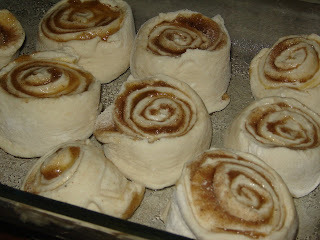 So here we go, the recipe for semi homemade cinnamon buns that take no more than 10 minutes to prep and another 15 minutes to cook. Mix cinnamon and sugar till well combined in separate bowl. With a pastry brush spread melted butter on dough. 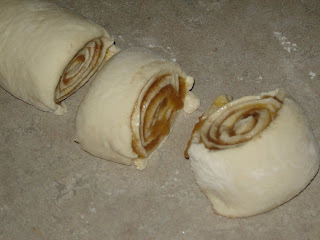 Sprinkle with cinnamon and sugar mixture evenly across dough. There should be a noticeable layer coating the butter. 5. 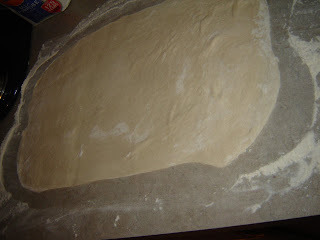 Roll the dough up as if you were making a snake. Do this as tight as possible. 6. Cut roll into 1 inch pieces. 7. 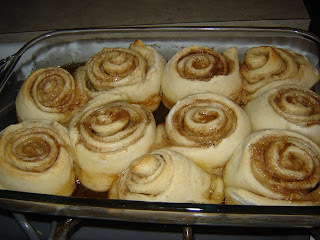 Place cinnamon rolls in greased pan and place in preheated oven. Now the hard part begins. You have to wait at least 15 minutes for them to finish cooking. About 5 minutes into cooking time the yummy and insatiable smell of cinnamon and sugar and butter will start to take over the kitchen. I made them extra indulgent by mixing some powdered sugar with milk as an icing. It ended up being one good Saturday morning. Planning a Maine wedding in New York is not the easiest thing to do. Add in traveling for work and the whole idea becomes quite stressful. Luckily the people we have been working with have been very lovely and accommodating. We booked our cake with someone based in Kennebunkport, Maine. Gayle Forte from Let them Eat Cake is delightful to work with. Again trying not to get into too many wedding details, I am going to jump right into the cake tasting portion. After considering Jordan and my hectic travel schedules were able to pin down a date when we would both be able to sample the cake options. Saturday's mail deliver found this cute little box outside our door. Neatly packaged the 12 different samples were moist and fresh. Yes, 12 different samples to taste. This my seem like a wonderful occasion. I thought so too. Then I had 5 samples. The 5 samples translated into a stomach ache. I am a trooper though. With much diligence, I stuck to the task at hand and finished all 12 options. Jordan and I had quite the process worked out. With mug of milk in hand, we tasted the cake, described what we liked and disliked and then ranked each flavor on a scale of 1-5. In the end only one piece ended on both of our top 3 choices. And what might you ask is the flavor we picked? Well you will just have to wait and come to the wedding to sample yourself. It has been almost a month since my last post. I have no excuse but to say I am busy and food has sadly not been a high priority. At least not in the enjoyable sense I would like it to be as a priority. I will say I was able to take a nice little break from work and travel to Florida for vacation. It's no surprise that we ended up in Disney World as this is one of Jordan's favorite places. Don't ask me to explain - I really have no explanation. However, I will say that Disney World has quite a few lovely restaurants that I enjoy. No complaints from me on the dining experience at Disney. 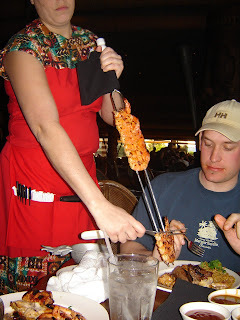 One of the restaurants we always try to get into (it is quite a feat too) is O'hana at the Polynesian Resort. It is serve family style or all-you-can-eat, a feature Jordan always appreciates. 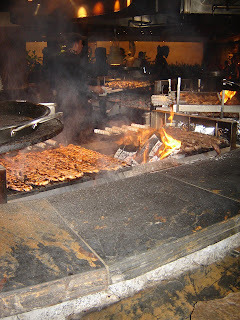 For those of you who have gone to a Brazilian steakhouse, O'hana is a similar restaurant. All of the meat skewers you can eat. Shrimp is by far the best option at O'hana. Jordan managed to eat about 30. 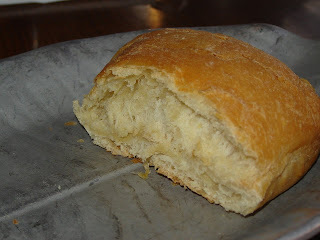 The meal starts with homemade pineapple bread. It is served warm with butter. One of the things I like the most about O'hana is that you can start with salad. I always seem to lack salad courses while in Disney. 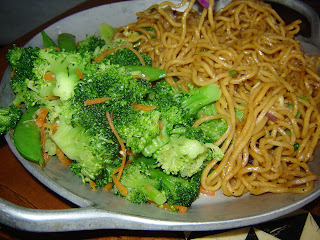 Salad is followed by broccoli, and Soba noodles. 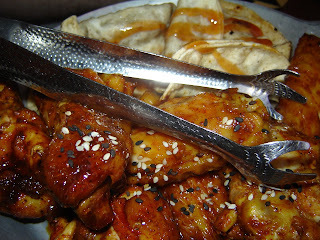 Potsticker dumplings and chicken wings also come. Each one is delicious but you really need to pace yourself. My first time dining at O'hana I was so happy sampling away all of these yummy foods I was completely full before the meat skewers even started coming. This is the gigantic fire pit where they cook the meat. Finally the desert comes. 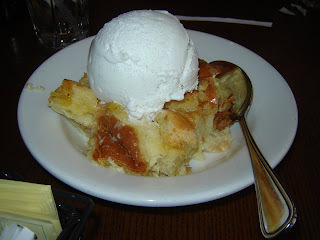 The sweet pineapple bread made into bread pudding. 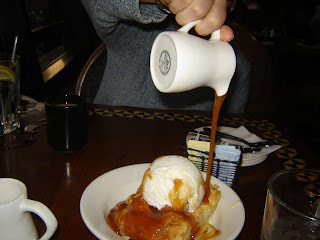 This is all topped with ice cream and then topped with banana foster caramel sauce. Yes, even desert is all you can eat. Every time I am so tempted to get another desert but at that point in the evening I really think it would be impossible to eat anything else. This restaurant is a sure bet when dining in Disney. Don't miss out!